Organic Gardening Tips for planting a garden with companion plants and natural gardening supplements. Organic Gardening Tips. The natural gardening guide for growing organic vegetables, herbs and flowers whether you're container gardening, homesteading or something in between. Going green at home by growing green at home. Growing organic gardens is easy, less expensive and beneficial to you... and to the planet. Organic - Of biological origin. Produced without artificial agents. Here, we'll divulge our methods for developing and nurturing an organic garden. Information we gleaned while growing 7 acres of certified organic echinacea along with our organic vegetable garden. The needs of a garden can be met with natural, non invasive techniques that don't poison the plant and it's surroundings. You won't need a large area to plant an organic garden either, any sized garden plot will lend itself to the TLC of a natural gardener. Even a container garden on your patio can yield healthy, thriving plants without using a single "artificial agent". Organic gardening is simply a method of growing food and fruit crops in a natural environment, the way our grandparents did it. Growing organic food yourself is the cheapest and surest way to get pesticide free fruits and vegetables for your family. We'll take you through some basic natural gardening tips here and for more information click on the links. That'll take you to pages with tons more information about particular subjects. The tools you choose will play an important role in the success of your project. For us, the best gardening tools for organic gardening are simple and effective and we discuss them at length on our best gardening tools page. There's more to organic pest control than picking bugs off plants. We'll show you our natural methods for keeping pests under control including some organic solutions and companion gardening tips. We love to keep pots of fresh herbs just outside the kitchen door. It's quick and easy to snip fresh organic herbs as we need them and the freshly cut plants send their fragrance through the house when a puff of breeze wafts by. If you have a small garden patch, square foot gardening is so easily maintainable it makes organic gardening a simple process that produces maximum product in minimum space. And while you're going green, although organic fertilizers are widely available at garden marts, it's easy to make your own in your garden or worm composter. Organic food benefits for your family are easy to achieve with a little basic knowledge. Here, environmental scientist and horticulturist, Jonathan shares how he works 8 hours per year to grow nutritious organic food in his back yard. Finding an ideal location for your garden takes some thought and planning. In some cases your choices are very limited and you have to work with whatever you have, choosing plants that can adapt to the available conditions. Here are some organic gardening tips to help you choose the best location when you're planting a garden... if you're lucky enough to have more than one choice. The most important consideration when you're planting a garden is sunlight. Choose the sunniest location on your property for your garden. Shade can be provided for plants that like it by situating tall leafy plants near them. Next to sun, water is the most important element when growing organic gardens (or any garden). Will you be using mostly tap water or will you be harvesting rainwater? Try to situate your garden in an area where you can easily access the water you intend to use. Hoses are great but, the longer the hose, the less pressure you end up with. Especially for kitchen gardens and herb gardens, which you'll harvest from on a daily basis, choose a location that is a short distance from the house. Soil, just as important as water, can be altered and with enough ammendments you can turn any garden plot into a well balanced, nutrient rich bed that will raise a fine organic crop. That being said, the whole process is easier if you start with a workable, light soil that needs few ammendments. Flat (or relatively so) garden plots hold water more evenly throughout the plot while still allowing drainage. Avoid planting in a pothole or hilltop. Potholes or depressions hold moisture too well creating an environment where soggy roots begin to rot. Hilltops don't hold water well enough and tend to be dry. A slight grade can work well if you plant the moisture loving plants in the bottom (wetter) area and the plants that like their feet relatively dry in the upper area. Small spaces adapt well to container gardening and the size of containers gives the gardener a higher degree of control over the plant's environment. The number of options for containers is endless. Be creative! Look at cream cans, water troughs, galvanized tubs, bathtubs, practically anything that'll hold dirt can be used for container organic gardening. Tips for places to look for unique containers include farm auctions, garage sales, classified ads and e-bay. Why raised beds? Because the soil warms faster, planting and weeding are easier, less water is needed and it's easier to keep the soil in the desired condition. Make a raised bed by constructing a rectangle or square (or any shape you wish) out of lumber, brick, stone, landscape ties, anything that can be formed into your desired shape. One of the positive things about a raised bed when planting a garden is that you stay outside it so that the soil doesn't get trampled down. Our organic gardening tips recommend making beds that are no wider than 4 feet. Beds that are more than 4 feet wide are harder to reach into and you're more likely to have to get into the bed to tend to your plants. Strategically place stepping stones in these beds and only step in those areas. If you'll only be able to reach in from one side 30 inches is deep enough. Remove the topsoil from around the outside of the bed and pile it in the bed. Mark out your garden area with garden lime then dig the entire garden plot down, at least a foot, removing roots and rocks as you go. We always used the 3 foot rule. The beds were 3 feet wide to make it easy to reach into them without tramping into the soil. The walkways were also 3 feet wide to allow us enough space to kneel down to access one row without our feet sticking into the next one. Organic Gardening Tips ~ Videos on making raised beds. Raised beds in the city. "Organic gardening tips" recommends that you place the frame on cardboard or several thicknesses of newspaper. It'll eventually turn into compost but in the mean time it prevents weeds from invading your bed from beneath. Use recycled lumber to save money and trees. Here's how to make a raised bed without a frame. Simple. Add soil conditioning agents til you have a light, fluffy soil that holds together in a ball if you squeeze a handful when it's damp but falls apart if you drop it from about 1 foot (25 centimetres). Organic compounds improve the tilth (condition) of your soil and are loaded with nutrients. Learn how to compost at home and feed your garden the vegetable scraps you don't eat. Plant your garden when the soil is completely thawed (if you live in an area where it freezes) and when there is just enough moisture that when you squeeze a handful in your fist a ball forms that holds together but no water drips from the ball. Seeds should be planted as deep as they are long. A lima bean seed will be planted deeper than a radish seed. One of our favorite organic gardening tips is companion planting. Using companion plants when planting a garden can reduce the amount of tending your garden needs over the next months. Companion plants are flowers, vegetables or herbs that provide a need for another plant when they are grouped together. Sometimes the help is in the form of a support for a viney plant or shade for a tender plant. 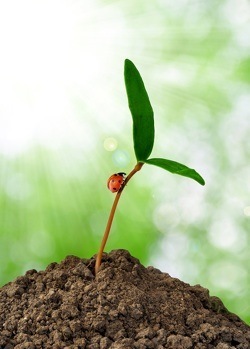 Others attract bugs to themselves that would cause irreparable harm to their companions and still others give off (through roots or into the air) beneficial nutrients for their neighbours. Plants need food in the form of nutrients. Compost, manure (from herbivores like, horses, cows and sheep), bat guano and worm poop are all beneficial additions when growing organic gardens. Following are some organic gardening tips for keeping the garden watered and still conserving water. Whether you're planting by seed or transplant, water the hole or row before you put the seed or plant in. Don't water the entire area, just the hole or row for now with a hand watering jug or hose (gravity fed is best because of the low pressure). This places water exactly where you want it and directs the roots downward to look for water. Your seeds will germinate more quickly and your seedlings will have water, right where it counts so they can begin taking hold immediately. Once you're done for the day, water everything again. There's something about rainwater that plants just like better, they perform better and seem to need less water when you're using rain water. The A rain barrel is a simple green addition to a back yard that ensures you have a supply for your garden... even when it's not raining. Gray water is the water used for bathing, laundering and washing dishes. Use eco laundry and dish soaps and they won't harm your plants. Direct this water to a collection tank or right out to the garden. Drip irrigation saves water but your plants will never know. They'll recieve as much water as they need but you won't be wasting it by watering non productive areas of your garden. Save a lot of water by putting it only where you need it. Watering the entire garden area is rarely needed and for smaller plots hand watering with a watering jug or a hose will use less than half the water a sprinkler will. A weed is any plant that is growing where you don't want it to. Weeds compete with plants you want to grow by taking water, nutrients and eventually, the room they need to flourish. Here are some organic gardening tips for growing only the plants you want in your organic garden. Weeding will always be a regular chore when you're organic gardening. Tips for keeping weeds away in the first place can make natural gardening much more pleasurable. Often more tenacious than the plants you're tending to, weeds quickly crowd your plantings, rob your plants of valuable nutrients and water and can overtake your entire garden. In an organic garden the first flush of weeds in the spring is the hardest to deal with. First, because the new plants are about the same size as the weeds, making it difficult to weed around them. Second, because there are just so many of them. If you keep up with it, every time you weed an area there are fewer of the culprits til by the 3rd or 4th time, a quick run over the bed with a hoe each week will take about 10 minutes. The best advice "organic gardening tips" can give you about weeds is to keep them from growing in the first place. It's easy to do with mulching materials. Mulching addresses several issues at the same time - keeping weeds down, adding nutrients to the soil, improving tilth and keeping the moisture in are among them. Adding compost, peat moss, manure or coco coir will improve the drainage and texture of your soil too. Spread a thick layer around each plant after watering. Thicknesses of newsprint under about an inch of soil will work to keep weeds down and eventually decompose and become part of the soil. Use 2 or more sheets at a time to make a layer between the weed seeds and the surface. As the paper decomposes add another layer. Do not use glossy paper such as magazines. Big pieces of cardboard are easy to cut to size are thick enough to make a good weed barrier and heavy enough to stay where you put them. Placed in the aisles or walkways between plots cardboard keeps weeds down and makes walking around your garden after a rain less mucky. Some organic gardeners keep grass growing between the plots. Instead of weeding the strips are mowed periodically. We didn't use this method although we contemplated it. Here's why we choose not to do this. In our case there was no grass so we'd have had to plant or sod it in. I had some concern about the grass taking nutrients and water from the beds, also, in order for it to look good the grass needed to be mowed and edged. I'm not saying it doesn't work I'm just saying that we opted against it. Had there already been grass there, we probably would have gone that route. Landscaping fabric is designed specifically for this purpose. It makes a great weed barrier while allowing moisture to flow through it (unlike plastic which keeps the water in a mosquito loving puddle, out of reach of the deep soil). It costs more than our other options and the better the quality the longer it lasts and the more money it costs. It is much easier to pull a whole weed (root and all) out of damp soil than dry soil. Use these organic gardening tips to create and care for your garden naturally. The difference you make by growing your own vegetables organically has a positive impact that's hard to measure. Keeping "artificial agents" out of our biosphere is only the beginning. You'll get fresher, tastier and more nutritious foods and no fuel is needed to transport them to you, whether from across town, cross country or internationally.